Young Dancers, Aiming For 'First Position' In the spirit of such competition documentaries as Spellbound and Mad Hot Ballroom, First Position follows seven young dancers as they prepare for the prestigious Youth America Grand Prix. Elizabeth Blair reports on the film and the dancer-turned-director behind it. First Position follows in the spirit of such competition documentaries as Spellbound and Mad Hot Ballroom, tracking seven young dancers as they prepare for the Youth America Grand Prix, a prestigious ballet contest. The first competitor we meet is a mature 11-year-old named Aran Bell. His father is in the military. He likes to skateboard and jump on his pogo stick. Aran began dancing when he was 4, and when he hits the stage, he turns and leaps with the poise and fire of a professional. "I just love ballet so much," he says. "It's hard to explain." That passion is evident in almost all of the dancers in First Position. But their personal stories are very different. There's a 16-year-old who moves to New York by himself from his native Colombia in search of opportunities. There's 14-year-old Michaela DePrince, who was adopted from Sierra Leone when she was a toddler. We learn about Michaela's extraordinary journey from an orphanage in her West African home country to becoming a part of a New Jersey family. And, as with all of the young competitors in the film, we see her perform — in rehearsal with her teachers, and before the judges and a live audience. Gaya Bommer and Aran Bell in First Position. Aran, who is 11 in the film, began dance training at age 4. The film also follows the dancers' parents to see the sacrifices they make — among them Michaela's mom, Elaine DePrince, who makes most of her daughter's costumes. "These little undergarments they wear under their tutus, they don't come in dark brown," she says. "I dye all these things for a brown girl, because they're all what we call 'flesh color.' Well, white flesh color." First Position was made by former dancer and first-time filmmaker Bess Kargman, who made a point of following a diverse range of hopefuls. "Not all ballet dancers are white," Kargman says. "Not all ballet dancers are rich. 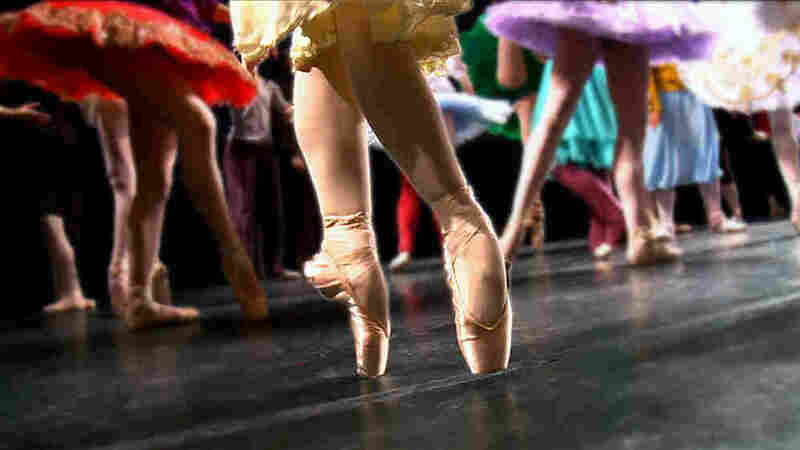 Not all skinny ballerinas are anorexic, and not all stage parents are psycho." But finding those families was a challenge. There are some 5,000 young people — ages 9 to 19 — who try to make it to the Youth America Grand Prix. And they're spread out around the globe. The competition has been approached by filmmakers before, but Kargman was the first to convince them to let her tell their story. "I told the competition, 'Here are all the types of people I'm looking for,' " Kargman says. " 'Go through registrants and whittle down [to] a couple hundred, and then I'll make calls. And I'll call these people, I'll email these people, I'll show up at their houses.' "
Kargman went all over the place, from Palo Alto, Calif., to Cali, Colombia. She says it took her and a small crew a year of filming and then another year of editing. She submitted First Position to the Toronto International Film Festival, and Elizabeth Muskala, one of the festival's directors, was not surprised to learn that Kargman had been a dancer herself. "She took great care of the subject matter, and the dancers trusted her," Muskala says. "The Youth America Grand Prix, they trusted her to tell the story of these young dancers, and I think you see the love of dance." As well as the pain of dance. Joan Sebastian Zamora, 16, left his mountain village in Colombia for greater opportunities in America. "People always think football players, soccer, lacrosse players are the people getting injured," one dancer says, "but ballet dancers get injured every day and still have to work through it." Kargman gives us a whole section on the dancers' battered feet — and their unnaturally stretched limbs. We meet their teachers, like Viktor Kabaniaev, a devoted, exacting Russian. "You're in ballet costume, young man," Kabaniaev says to one dancer. "Can you pull up and take your stomach in? Squeeze your breakfast." Kargman says people like Kabaniaev can't be cast; they just exist in real life. "And as a filmmaker," she says, "you feel very lucky when they come into your life." But luck can get you only so far. For this first-time filmmaker, and for these young dancers, it's perseverance and hard work that pay off in this new documentary.